Marcus Peters’ NFL career began with uncertainty. His rookie season ended with a certainty that no one should have doubted him in the first place. “Character concerns” was the most popular phrase used around Peters in the 2015 pre-draft process. The 6-foot, 197-pound cornerback from Oakland, Calif., had been kicked off the team at the University of Washington during his junior season for disciplinary issues, a few weeks after he’d been suspended for throwing a tantrum on the sideline during a game. 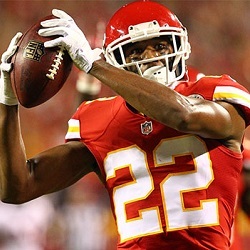 The Kansas City Chiefs believed in Peters enough to make him the 18th overall pick in the first round, and as a rookie he finished with 60 tackles, eight interceptions (tied for the NFL lead), two INT returns for touchdowns, and one forced fumble. He helped the Chiefs make the playoffs and advance to the AFC divisional round, where they lost to the New England Patriots. Peters was almost unanimously voted NFL Defensive Rookie of the Year by the Associated Press — becoming the first defensive back to win the award since Charles Woodson in 1998 — and fellow NFL players voted him No. 65 on the NFL Network’s list of the league’s top 100 players.